What It Is: Books are often brilliant sources of inspiration – but this has to be one of the brightest uses of them yet. My husband and I are unabashed Shark Tank / Dragons Den fans, and if you spotted Lumio, today’s featured gift idea, on the show earlier this season then you’ll remember how ecstatic the Sharks were about this innovative product. 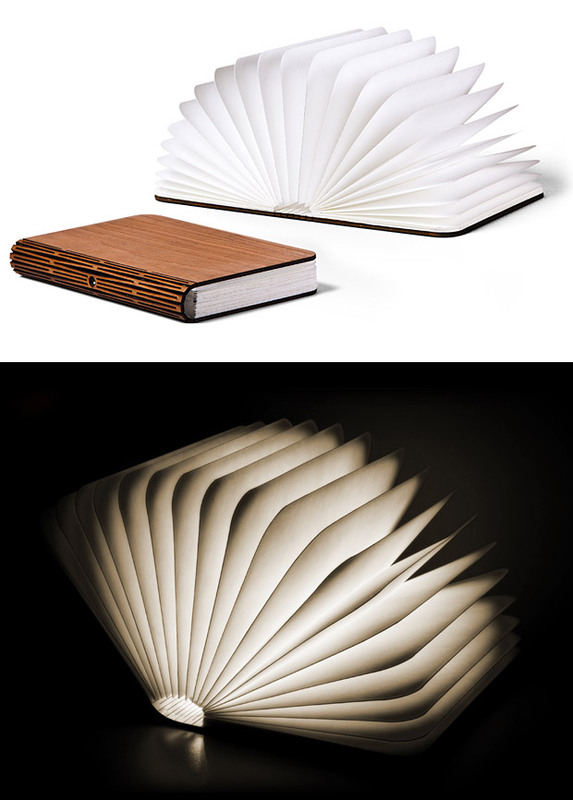 To break it down, Lumio is a portable, flexible, rechargeable lamp that when not in use, can be folded down into a book (there’s also a new mini version). It’s available in two different colours and can be arrange in all kinds of way, as it’s got a magnetic piece that allows you to actually bend the spine 360 degrees. Dangle a few from a bar for a makeshift chandelier, string em up outdoors for some whimsical patio lights, stash one in your car or purse for emergency purposes, or simply have one on your bedside table. Who It’s For: Your bookworm spouse, as a gift they’ll cherish. Your designer friend, who’ll love the aesthetic of it. Your new homeowner son or daughter, as a cool housewarming pick. What It Costs: Pretty doesn’t come cheap. The big Lumio lamps are $190, at the moment the little ones are $100, although I suspect that’s a promotional price. Shipping is $45. All prices are USD. Where It’s At: Lumio is available online – hopefully they’ll start selling in some design or museum shops up here too! BONUS entry (your very last one) into my Find of the Month for Nourage. Tell me in the comments below – what do you think of this snazzy gift idea? I love this unique light. It would make a great gift! That is so cool, it would be a nice gift, if I could part with it. This would make a great conversation piece. I love to read so this would be a great asset. Very cool – would make a great conversation piece! I saw this light featured on the show Shark Tank or Dragons Den. Brilliant idea! This is so cool. I want it!!! It’s nice but I don’t have a need for it at this time. I have often thought of buying one of these… and in fact I think I have a use for one right now (which I didn’t expect during the kickstarter actually, hence why I didn’t buy one). Lumio is fantastic. In fact, this product that brings to mind “why didn’t I think of that years ago!” I know many people that would use it a lot if they only had one. I’m not sure that it would fit into our decor, but it sure is different – originality is great! I love it, as my husband is a writer, this would be a unique gift for him. As an avid reader, I love this! It is gorgeous but a bit pricey! It would be a great gift for any bookworm! Nourage bonus entry: I like this snazzy gift idea but not the shipping price! I love it and it would make a great gift. It’s a snazzy gift idea that I would love to have. I love it but it’s expensive! It’s a bright idea (pun intended). However, for me, the price and the shipping charges keep it from being a viable gift option. This is super sweet! It’s very stylized. This is a very unique gift idea!